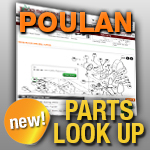 Find your replacement Poulan pulleys below, including Starter Pulleys. If you need Chain Saw Pulleys like Starter pulleys, Jack’s is the place to check first. Look below to find the type of replacement Poulan pulley you need.